Our Cedar Color Pyramid 6x6 fence post caps will take a tired, old, and dingy-looking fence or deck railing, and give it a new lease on life. Whether you have a new fence, and you want to protect your investment, or you’re trying to preserve an old fence, out 6x6 post caps will accomplish both of those goals. We call the color of these post caps “cedar” because it is much redder than our dark brown post toppers in the series. 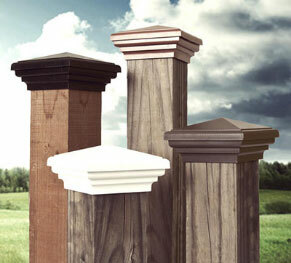 We offer these cedar color 6x6 fence post caps in two sizes: Nominal and True (or Actual.) The term nominal refers to posts that are made from green (undried,) rough cut pieces of wood that haven’t been smoothed down and planed. The term true (or actual) refers to seasoned and dried wood, posts bearing this indication were cut into 6x6 posts after the wood dried. Our 6x6 fence post caps in the nominal size will fit standard posts whose dimensions range from 5.5” x 5.5” up to 5.75” x 5.75”, Our true or actual post caps will fit posts that are between 6.0” x 6.0” and 6.25” x 6.25”. We’re proud that all of our ASA resin products are made in the USA. Our cedar color 6x6 post caps are made of a strong and highly durable material called ASA resin. It’s used in the automobile and marine vehicle manufacturing industry. It is a hard plastic that’s known to be UV and impact resistant. It will also resist discoloration, fading, or warping. And we’re so confident in its superiority to wood that we offer a 10-year guarantee on all of our ASA resin post caps for ten years. ASA resin doesn’t weaken the way wood does from contraction and expansion. It won’t rot, get moldy, or erode from damage that gnawing furry creatures and insects may inflict on it. And our 6x6 fence post caps cost a fraction of what you’d have to pay for comparable wood caps. Our patented SNAP-CAP installation system ensures a fast and easy install process, without the added expense of hiring a professional to do it for you. Once your post caps are installed, you won’t see any screws.